Last year GeoStabilization commenced a project for one of Alberta’s electrical transmission companies which involved solving a difficult problem relating to the installation of bases for replacement transmission power poles in variable hard rock substrates in Banff National Park. In some locations, rock was outcropping on the surface, while other sites had soil overlying the hard rock. Blasting was not feasible due to the power line traversing mountainous terrain, and large equipment could not be used to construct bases using conventional methods. These constraints led the choice to use limited-access drilling techniques to complete the bases. The original drilling contractor had struggled to complete their work scope, and left some pole bases unfinished. It was critical to have all pole bases completed in 2017 ready for the new poles and new lines to be installed in 2018. 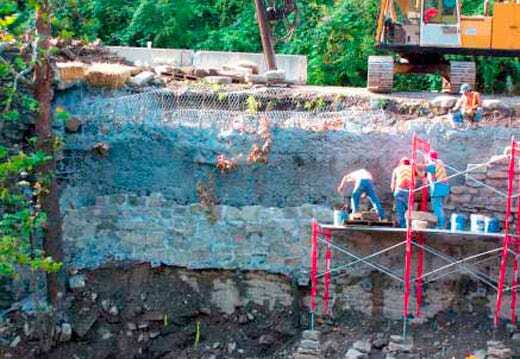 GeoStabilization provided a design/build solution using lockweld mechanical anchors drilled into competent rock. On sites with overlying soil, GeoStabilization installed micropiles integrated into a concrete cap with the lockweld anchor brackets cast into the concrete. The project team recognized that installing the poles into the bracket system on a very steep mountainous slope using a helicopter may present additional issues, as the lockweld system had not been used on these kinds of bases in this area. To verify both design assumptions and installation feasibility, engineers with GeoStabilization proposed a full-scale trial of pitching a pole by helicopter to ensure the system would work as intended, and could be constructed with the highest possible safety standards. The trial was a success, with all four lifts ending with the pole seating into the brackets with minimal effort (despite the heavy snow and -10C weather during the trial). Click here to watch a video of a helicopter lift.